The magnetic nanotag-based protein assay chip has a 200 microliter reaction well and is supported by an 84-pin ceramic base. Embedded in the bottom of the reaction well are 64 sensors in an 8-by-8 array. Credit: Osterfeld et al., PNAS. The detection of cancer-associated proteins, or biomarkers, in blood samples is a potentially powerful tool for early diagnosis of cancer and monitoring of cancer treatment. A team led by researchers at Stanford University and the University of California, Santa Cruz, has developed a compact prototype detector that uses magnetic nanotechnology to spot cancer-associated proteins in a human blood serum sample with much higher sensitivity than current detectors. The researchers describe their results in a paper published in an upcoming issue of Proceedings of the National Academy of Sciences (PNAS). In addition to its high sensitivity, the new detector can monitor multiple biomarkers simultaneously. This "multiplex" capability is important because the use of multiple biomarkers is likely to provide greater accuracy and reliability than single biomarkers for cancer diagnosis and other potential applications, said Nader Pourmand, professor of biomolecular engineering at UCSC. "With current detectors, you can only detect one protein at a time," Pourmand said. "Instead of the standard fluorescent tags, we used nanosized magnetic beads as tags and were able to detect target molecules with tens to hundreds of times greater sensitivity than standard techniques." "This is essentially a proof-of-concept study showing that now we have a chip and a reader that can find multiple biomarkers in a sample at a concentration much lower than the standard that is commercially available," said Shan Wang, a Stanford professor of materials science and engineering and electrical engineering. Wang and Pourmand are senior authors of the paper, along with Stanford biochemistry and genetics Professor Ronald W. Davis. To tag the cancer proteins with magnetic nanoparticles, the detector subjects blood serum samples to an incubation process that takes place in roughly half an hour. At the heart of the detector is a silicon chip designed by the paper's first author, Sebastian Osterfeld, a Stanford materials science and engineering doctoral student. The chips have 64 embedded sensors whose electrical resistance changes in the presence of a nearby magnetic field. Attached to these sensors are capture antibodies that have the unique ability to latch on to specific cancer-related proteins as they float by. During the incubation process, these antibodies first capture their specific cancer proteins. Next, a second wave of antibodies attach to the specific cancer proteins on one end and magnetic nanoparticles on the other end, tethering the captured cancer biomarkers to magnetic "nanotags." 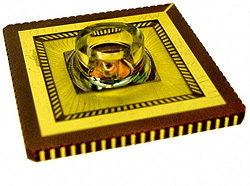 The tags emit a magnetic field that causes a change in the resistance of the underlying sensor, giving the detector a clear signal. In the PNAS paper, the researchers described detection of very low concentrations of various cancer biomarkers, such as tumor necrosis factor alpha and cancer embryonic antigen. In a multiplex assay involving seven potential cancer biomarkers, concentrations ranging from 5 quadrillionths to 0.1 trillionths of a mole (a standard unit of measurement for molecules) were unambiguously detected simultaneously. The researchers also estimated that they could detect levels of the protein human chorionic gonadotropin about 400 times lower than the concentration detectable by current commercial kits known by the acronym ELISA, in which captured proteins are conjugated to color-altering or fluorescent labels. To properly prepare a patient's blood sample for use with the detector, a technician must use a centrifuge to separate out the serum, which contains the biomarkers. For this reason, the device would need to be located in a hospital or a private diagnostic lab, Wang said. Even before that, the device faces clinical utility testing and then must undergo clinical trials to win regulatory approval. To see the device through those steps, Pourmand and Wang have cofounded a startup company, MagArray, in the Panorama Institute for Molecular Medicine, a nonprofit incubator in Sunnyvale, Calif.
Wang said he is optimistic that the technology could someday save lives by detecting cancer early or by helping doctors to select more effective therapy. "The earlier you can detect a cancer, the better chance you have to kill it," Wang said. "This could be especially helpful for lung cancer, ovarian cancer, and pancreatic cancer, because those cancers are hidden in the body." The nascent startup has also begun to apply the technology to diagnosis and assessing risk of heart attack in emergency rooms. Heart cell death is also associated with the release of specific biomarker proteins. The research was funded partly by grants from the U.S. National Institutes of Health, the National Science Foundation, and the Department of Defense. Other authors of the paper include Heng Yu, Richard Gaster, Stefano Caramuta, Liang Xu, Shu-Jen Han, Drew Hall, Robert Wilson, and Robert White, all of Stanford, and Shouheng Sun, of Brown University. Note to reporters: You may contact Pourmand at (831) 502-7315 or pourmand@soe.ucsc.edu.